A recent magazine article opened with this phrase… “Microblading, tattoos and permanent makeup are more popular than ever.” This reflects a new trend I see happening. Re-naming things to gain market share. And actually… it’s just history repeating itself. A tattoo, by definition, is implanting pigment into the skin in a way it doesn’t exfoliate off as the skin heals. It doesn’t matter what you call it, it’s still a tattoo. Even skin coloration dots used for radiation are a tattoo. The techniques vary slightly but they are all forms of tattooing used to create the look of makeup. To learn one technique, or perform one technique, limits the ability to meet diverse needs. Think of it this way… one size never fits all. So why did people coin all these different terms? Marketing. Even just 20 years ago tattooing wasn’t mainstream. “Nice” people didn’t get a tattoo. So they came up with alternative terms to step away from being associated with tattooing. All that has changed. Now 40% of millennials, 30% of gen-xers, and 13% of the boomers have at least one tattoo. Many have more. The stigma of a tattoo is gone. Alternative terms are used for marketing or to describe a “style” of eyebrow work. The key difference among tattooing is its purpose, where it’s placed and the type of pigments used. Artistic tattooing is decorative in purpose. It’s placed anywhere on the body. That said, most experienced tattooists don’t like to work below the wrist, below the ankle or on the head. They call those areas “trash skin” because they don’t take the color well and it tends to blur quickly. Their pigments are classical in formula using a full range of colors. They tend to be bright, clear and are formulated to replicate the tones found in nature. Colors will fade over time with exposure to UV. Carbon Blacks can blur and spread into wider lines. With permanent makeup, the work is on the face or after cancer on the breast. Its purpose is to create a makeup look or replace missing color. Pigments are formulated to meet this purpose. They use an iron-oxide black formula to minimize the risk of migration over time. The pigments are creating the look of makeup. They are blends, not color-wheel tones. Work on the face, it gets regular UV exposure. Traditionally, color re-enhancement is 2-5 years. Microblading techniques for the eyebrows put in less color. They will need re-enhancement every 8-12 months. Whether you are seeking microblading, tattoos or permanent makeup there is something more important than the name associated with a style of work. That’s the amount of training and experience of the person performing the service. Traditional tattooists may spend a year, or several, learning their craft. Unfortunately for the consumer, this isn’t true with permanent cosmetics. In most states, the only regulation on tattooing is the minimum age of the client. Some have regulations regarding infection control. But only a very few states have regulations regarding technician education requirements. In most states, it’s legal for someone to offer permanent cosmetics with little to no training. If you’re a consumer… do your research. Find someone who has had more one or two days of training and can offer you the style of work you are hoping to achieve. Explore your options and feel comfortable with your choice. If you are searching for a technician, visit the Society of Permanent Cosmetic Professionals (SPCP) website. They provide a list of technician members who meet national standards. https://www.spcp.org/thinking-of-getting-a-cosmetic-tattoo/find-a-technician/. If you’re a technician or wanting to learn this art, invest the time and money to develop your skills. Look for a program that at least meets the SPCP training standards. They recommend all programs, even those teaching only one technique to be at least 100 hours. https://www.spcp.org/information-for-technicians/spcp-guidelines/. Your reputation and your client’s face are in your hands. How can I get semi-permanent makeup? I routinely get questions about semi-permanent makeup. Women like the idea as it sounds less committed. But there are some illusions here. Let’s explore them. Pigment implanted into the skin creates a tattoo. The needle goes through the epidermis (the part of the skin we see) into the dermis which is underneath it. As it heals, any pigment in the epidermis exfoliates off. The pigment in the dermis stays there. The color can fade but the molecule remains. Some countries feel that because the color does fade with exposure to UV it doesn’t last a lifetime. Since it fades they classify it as semi-permanent. In the USA the thought is a little different. Think of hair color for a minute. A rinse is a temporary color that washes out with the next shampoo or two. Semi-permanent color fades out over several weeks or a couple of months. Permanent hair color has to grow out. This situation doesn’t exist for a cosmetic tattoo. Once it is in the dermal tissue, the molecule of color stays there. Pigment molecules were identified via biopsy in tattoos where they color is gone. The color will eventually fade and need re-enhancement. How quickly it fades depends on the volume of color implanted. With microblading, the technician only makes a single stroke of color application. This means there will be significant fade in just a few months. Other techniques reinforce the color stroke making it last much longer. A solid fill power brow can last for years with good sun protection. Microblading only works for eyebrow hair strokes. Never eyeliner or lip color due to scarring. The only way to get less color in lips would be to apply less. But without reinforcement, the color has a higher risk of fading unevenly. Can’t I just let it fade away? Absolutely. Without re-enhancement the color will continue to fade. But it doesn’t always fade evenly. It may fade with lighter and darker areas. This isn’t technician error, it’s rather caused by the physical structure of the epidermal-dermal junction with thicker and thinner areas. To keep your work looking fresh and color-true, a re-enhancement every two to five years is best. Lipcolor may be longer. With a cosmetic or any other tattoo, it’s always best to approach it as permanent. Avoid fad styles and go with a more conservative, classical approach. Something that will enhance your natural looks and make you feel good about yourself for years to come. Want great brows? Here are some secrets to help you get the brows you’ve wanted so long. Each of us has our own unique vision of what eyebrows should look like. Others have said to me, “I don’t know what they really should look like. It’s confusing.” I help them discover their perfect brow. And then there are the fashion fads. Right now big bold brows that almost meet in the center of the nose and extend out beyond a normal brow are popular. These might look well on a tall statuesque model. On a smaller person, they look over done. Your face, your bones, dictate the best brow shape and placement for you. Ignore this, and you will never be completely happy with the result. If you want fashion trendy brows – use cosmetics. Don’t have them tattooed this way. It is a recipe for unhappiness. Keep in mind that while permanent cosmetics do fade, it can take 20 years or more for all the color to disappear. A shadow of color can last even longer. Get it done right in the first place. Once done, there are limitations to what change or “fixes” work. Here are some tips skilled professionals wish every potential client knew. 1. Everyone’s brows are asymetrical. The two sides of our face are not the same. You will always have a favorite brow. Your technician can help make them look closer to the same, but they will never be identical. One eyebrow bone is naturally higher. That is the way we are. Skilled technicians have ways to minimize this but they can’t eliminate it. 2. Your technician should measure and mark the plan for your eyebrows. Freehand work is not the way to get the most symetrical brows. 3. There is no one right style of cosmetic tattooed eyebrow for everyone. Not everyone looks good with the same haircut. It’s the same with your brows. You need a technician skilled in a variety of styles to best help you. If you have been filling in your brows with a pencil or powder, a powder fill, or ombre technique may be best for you. From arm’s length away, you will look very natural, just like you have a bit of makeup in your brows. Those used to this look find the hair strokes or microblading look like there are bare spots. 4. Different techniques need different re-enhancement. Microblading needs a re-enhance every 8-12 months. It is best for those who want individual hairs to show and don’t mind the extra expense. Powder fill or ombre (shaded) brows can last 2-5 years before they need re-enhanced. 5. Your medications and lifestyle can affect color retention. Your eyebrows will need daily SPF for longer lasting results. Experienced technicians know that if it has been more than 5 years clients need a “new” brow. Re-enhancement perks up the exisiting color. More faded work needs a follow up visit to bring back the brow the client wants. That means they need a new brow procedure which includes the needed second visit. Do your research. Go in for a consultation. If you and the technician are of the same mindset, go for it. Enjoy those brows. Each client has their own unique vision of what eyebrows should look like. Selecting an eyebrow style or technique must be matched to the individual client, their goals, their needs. I never do a “cookie cutter” approach. There is no one right or best style except the one that is best for YOU! Sometimes eyebrows suffer from fads. Skinny little lines or big fat brows that nearly meet in the middle of the nose. Neither is a great choice for permanent cosmetics. Yes, permanent makeup fades, but it takes a long time, years to completely go away. In the mean time you are stuck. Changing brows once they are in place is very difficult. The end result will be better, but not as good as it could have been if done right the first time. Your face, your bones dictate the best brow shape and placement for you. If we don’t respect the bones, the brows don’t age as well. You want them to look fabulous today, next month and years from now. I always take before and after photos so we can see you in your current makeup, without makeup, and the finished result. I measure and mark, with your input. We design them together. Brows should always be measured and marked – not done freehand. You get a much better outcome. Why? Because everyone’s face is asymmetrical. We want to give the illusion of them looking more alike but respecting the bones. Together we evaluate your goals, your skin and come up with a plan to get your look. Microblading is a current marketing style. It is individual hair strokes which has been done for over 20 years. The key difference is it is done with what they call a blade. But is is not really a blade. It is a manual tool with a single row of needles. The skin is stretched taunt and the blade drawn across the skin in a slicing action. Done too superficially, it fades away in 4-6 weeks. Done too deeply, it can scar. Each hair is applied in a single stroke, not reinforced. The finished look is individual hairs with skin showing through between. Because the strokes are not reinforced this technique requires at least annual re-enhancement. Hair strokes: This technique can be done with a manual, or motor driven device. It uses a single row of needles like microblading. Hair strokes are implanted one at a time. Some may be reinforced for better hold. For a natural look strokes may be done in different directions. This technique needs re-enhancement every 18-24 months. The Blend: This technique is done either with a manual or motor driven device. Needle choices are slightly broader. Hair strokes are implanted and then portions of the brow, where hair naturally grows more dense are reinforced so the end effect is natural looking, with some hair strokes showing and some blended. Typically re-enhancement is 2-3 years. Powder fill: If you are used to seeing yourself wearing pencil filled brows, this may be the look you really want. While the pigment is still implanted in hair strokes, they are closer together. Healed, the finished look is you in well designed, makeup. Skin does not show between the strokes. Some clients think they want the hair strokes, but don’t like the “holes” between them where skin shows through. Re-enhancement varies from 2-5 years depending on many factors. Shaded: This can be done with any of the other techniques. It uses multiple shades of color to create highlighting along the top of the brow and shading along the bottom to give it more three dimensional feel. Want to know more about your very best brows? Call today: 541-344-7789. Permanent Cosmetic Brow Styles – What is right for me? There has been a lot of marketing and promotion about different brow styles which makes it very challenging for the consumer. How do you know what is right for you? Find a technician that is also a makeup artist and has studied classical brow shapes and the different facial structures. Ideally your brows should follow the flowing arch from the top of the nose that curves up onto the brow bone. This flow point is the ideal starting point. Brows should then follow the bone structure. 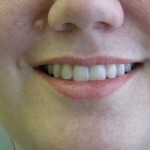 Floating above the bone structure can create a “Mrs. Spock” alien appearance. The brow should flow up the bone and then back down so that the tip of the tail is no lower than the base of the brow where it starts near the nose. If it is allowed to drop lower at the tail it will pull the face down resulting in a more aging appearance. Solid dramatic brows are one brow style. They have a very “done” makeup look. While some people prefer this look, care must be exercised as it can be a harsher look on a mature face. 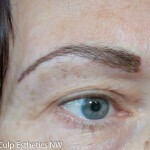 This style of brow can last the longest between re-enhancements. Powder brows are a much softer look. The appearance is less of a pencil and more like a bit of brow powder was added to fill in the brows. They last well and can be re-enhanced typically every 2-5 years. Hair stroke brows incorporate single hair strokes added one at a time with a very fine needle. To keep the fine hair look less pigment can be implanted or the hair will get thicker giving a heavier look. While this style can look very realistic, this is harder to achieve if there is no existing hair. Hair stroke brows require annual re-enhancement since much less color can be implanted to maintain the look. Blended brows incorporate the hair stroke technique with some powder infill. This style still maintains the individual hair appearance but with a denser look that requires much less maintenance. The brows are filled in more densely where they tend to grow more dense – on the inner half of the brow and the lower 2/3 of the brow. It is a very natural realistic looking brow for those who want a hair stroke look with ease of maintenance. Like the powder brow this brow will need re-enhancement typically every 2-5 years. Most of us are familiar with brow waxing. It is a tidying up of the brow area removing extraneous hair. Brow designing is this and a lot more. Well shaped brows frame the eyes in the same way your hairstyle frames your face. The right style makes the most of your features while the wrong style can make you look out of balance or proportion. The brows play up your eyes. There are actually mathematical formulas for creating the best balanced brows and we can thank Leonardo daVinci for creating them. His formulas used in his paintings and in the sculpture of Michelangelo and others have stood the test of time for ageless beauty. We still use them today. They help you avoid the rogues gallery of infamous eyebrows that make you look sad, surprised, scowling or older than your years. In a brow design session we evaluate your brows, your bone structure and personal preferences then we work together to design a brow that will look good today, tomorrow and for years to come. We can also talk about other brow challenges, skimpy brows, missing brows, graying brows, and directional hair growth problems and the solutions that might be best for you. Whatever your preferences, we can show you how to make the best of your brows. Whether you need hair removal, trimming, brow makeup or permanent cosmetics, we can help. 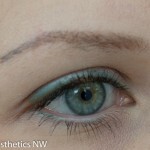 Is it time for you to “spring” into a new look with brow designing? A division of Culp Enterprises, Inc.
Coconut Oil Right for YOU?